The son of a shipbuilder, Eisenstein chose a career in the arts over engineering or architecture. After W.W. I he worked as a designer and a director in the theater, where he developed his theory of "Soviet realism." One of his plays was staged not in a theater but in a gasworks. It was inevitable that Eisenstein would gravitate toward cinema, with its natural potential for realism. His 1st film, Strike (1924), was so inventive and vigorous that it drew immediate attention. The 27-year-old director filmed Potemkin in 2 months. It is remarkable for its maturity and masterly use of camera techniques. Eisenstein was also a pioneer in film editing, and the film is a virtual textbook of this art. In a famous scene, a baby carriage rolls down a long flight of steps while a horrified student watches helplessly from below. The images are intercut and the action slows down, alternating the separate images into one shocking scene. So original was his style that even though it has been copied endlessly, nothing since has equaled it. When Soviet leaders became aware of the vast technical superiority of Hollywood production, it was only natural that the titanic young film maker should be chosen to study in the U.S. Eisenstein was lured by Hollywood as doggedly as a promising high school athlete is by American universities, but the promises of complete directorial freedom and vast sums of money never materialized. He signed with Paramount, whose executives were subsequently shocked that the Russian Cecil B. De Mille could come up with ideas so devoid of popular appeal. In 6 months Eisenstein and the studio proposed and rejected 7 projects before Paramount gave him a return ticket home. By then, Eisenstein had been called a "defector" by the U.S.S.R. and was anxious to remain in America. He undertook filming a massive folk epic about Mexico, with the financial backing of the novelist Upton Sinclair. The stocky 32-year-old director was extremely temperamental. The project expanded from its 3-month schedule into a 2-year ordeal for the novelist, whose wife had mortgaged her house to finance the picture. Sinclair accused Eisenstein of maliciously discrediting anyone who stood in his way and of trying to stay in the U.S. regardless of the cost to his friends. "The most charitable interpretation that I can place upon Eisenstein is that he is an egomaniac," Sinclair said. The project ended when Sinclair gave the editing of Que Viva Mexico to someone other than Eisenstein; the film was never completed. 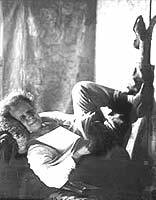 Eisenstein returned to Russia, completely dispirited, with nothing to show for 2 years' work. After he returned to the Soviet Union, Eisenstein was a man on a leash. As a teacher in the Moscow Film Institute and while directing his later films, he was under the watchful eye of Soviet censors. Eisenstein had to apologize publicly for forgetting "those great ideas that our art is summoned to serve"--namely, socialism. He died of a heart attack in 1948 while still working on a mammoth epic, Ivan the Terrible. After Stalin's death in 1953, Eisenstein was once again honored in his native country. - Writings, 1935-47: S.M. Eisenstein , Sergey EISENSTEIN, , Richard TAYLOR, 1996, BFI Pub. - Montage Eisenstein , Jacques AUMONT, 1987, BFI Pub.